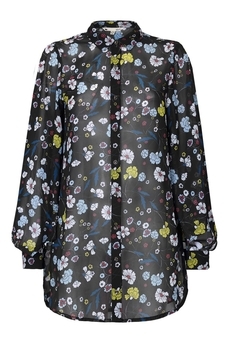 Nouveau Floral shirt-tunic will give your florals a seasonal refresh. Beautifully crafted with a relaxed silhouette, in a lightweight semi-sheer fabric, it features long wide sleeves with open detailing around cuffs, shirt collar and button fastenings though front. Style it with a pair of skinnies for an ultra-feminine look. Is approx. 80cm in length. Composition: 100% Polyester. Color: Black. The item in this size, is sold out.